Due to the efficiencies of our modular build method, quality is improved while time and money are saved. 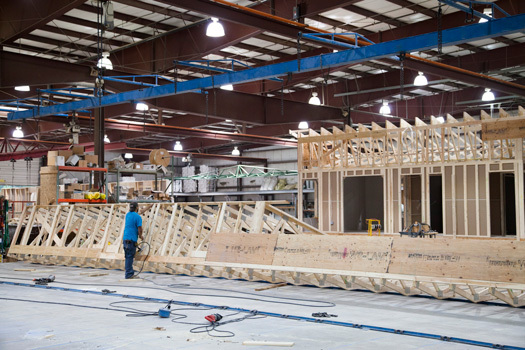 Many tasks that occur throughout the building process become automated efficiencies when done in our factory style setting, and therefore exceed the quality and speed of what can be done in traditional construction. Custom home plans are also executed with our design-build strategy, taking advantage of all of the benefits that come with the indoor building process. Using a Terrace Homes pre-designed home plan that has been customized to fit your lifestyle is a great option, and decreases the overall project time even further. Construction happens in the protection of our indoor factory, keeping your project from being subject to labor or weather delays and keeps our timelines predictable and accurate. Once the pre-construction phase is complete and the design plans are finalized, your home will go from paper plans to move-in ready status in four to six months. Thanks to Terrace Homes’ careful coordination, this is 40% faster than traditional stick-built home process.